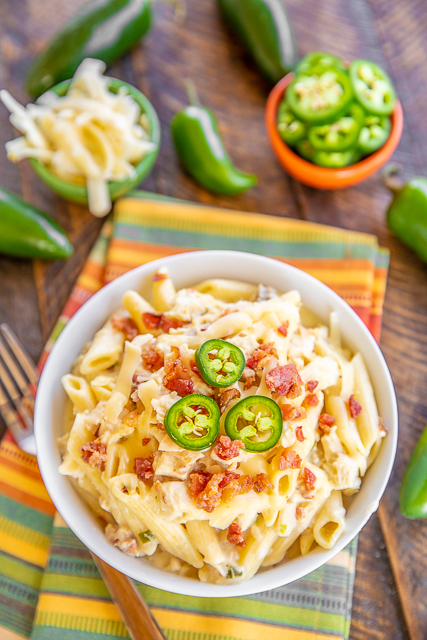 Instant Pot Chicken Jalapeño Popper Pasta - creamy chicken pasta loaded with bacon, jalapeños, and pepper jack cheese! Seriously delicious! 4 minutes of cook time. We ate this two days in a row. Chicken, jalapeños, bacon, garlic, onion, chicken broth, water, cream cheese, penne pasta, and pepper jack cheese. Everyone cleaned their plate! Even our picky eaters!! Where are my Instant Pot lovers? This is a recipe for you! 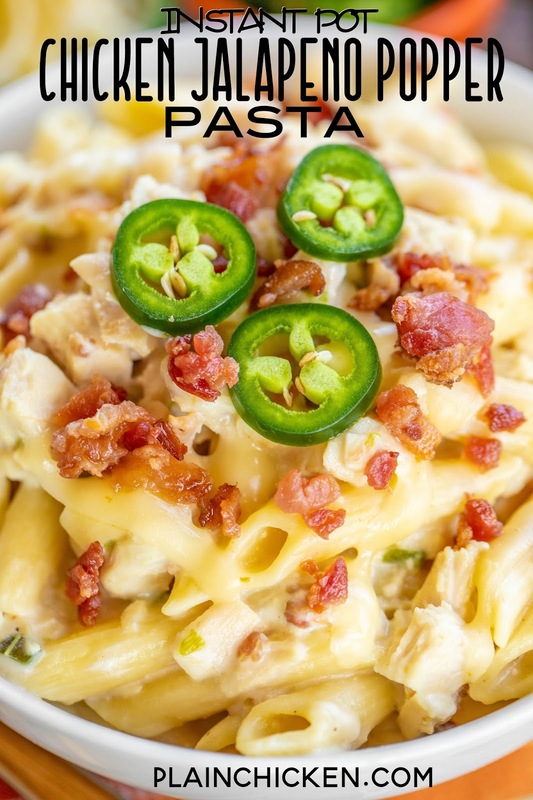 This Instant Pot Chicken Jalapeño Popper Pasta is crazy good and only has a 4 minute cook time! Boom! Pasta is one of my favorite things to make in the Instant Pot. I love that I can just dump everything in the pot and it is done. I also love only having one pot to clean after dinner. 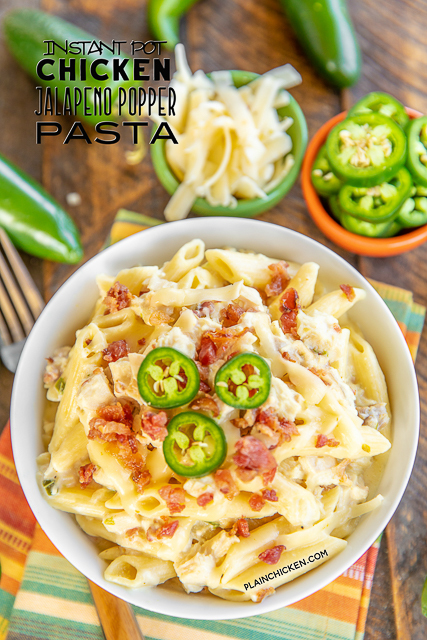 This Instant Pot Chicken Jalapeño Popper Pasta is a favorite in our house. It is great for a quick weeknight meal or any upcoming Cinco de Mayo parties!! The Instant Pot is an electric pressure cooker. Depending on which model you buy, it can also be a slow cooker, rice cooker, used for canning, yogurt maker, sous vide, steamer and a warmer. You can even delay cooking for up to 24 hours. They even have Instant Pots that connect to your phone via WiFi. It is a magical thing. I have a very basic model, and it works great. It has 6 features, but I have only used the pressure cooker function. I have a 6-qt Instant Pot. It is just fine for cooking for 4 to 6 people. If you have a larger family, you might consider getting the 8-qt. 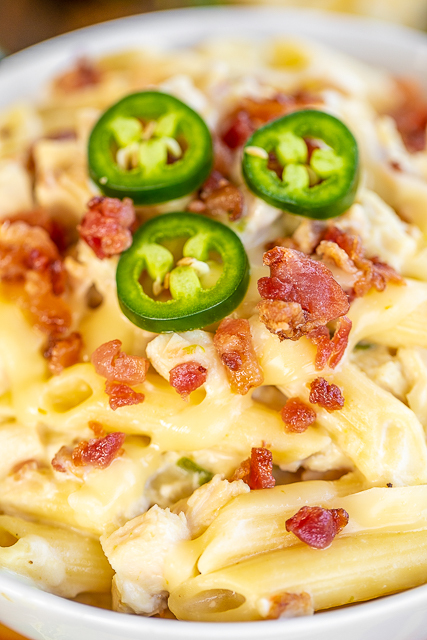 This Instant Pot Chicken Jalapeño Popper Pasta is very easy to make. Start with the Instant Pot on the Sauté setting and cook the chicken. Next dump in the jalapeños, pasta, and liquid. Make sure all the pasta is covered with liquid before closing the lid. Next, set the Instant Pot to High Pressure and to 4 minutes. Once the cooking time is done, stir in the bacon and cheeses. SO easy! 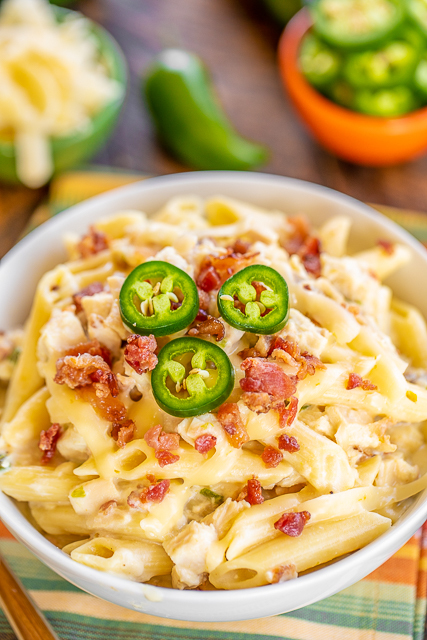 This Instant Pot Chicken Jalapeño Popper Pasta is a favorite in our house. I mean, how can you go wrong with chicken, bacon, cheese, and jalapeños? I always discard the seeds and membranes in fresh jalapeños to reduce the heat. We didn't think this pasta was spicy at all. If you want some heat, leave the seeds and membranes when chopping up the jalapeños. One tip for cooking in the Instant Pot is to deglaze the insert after cooking the chicken in this recipe. Deglazing is just a fancy way to say add some liquid to the pot while it is still hot and scrape up all the cooked bits off the bottom. That will ensure you don't get the dreaded BURN notice on the Instant Pot. Preheat Instant Pot on “Sauté” setting; add oil, chicken, jalapeños, minced onions, and garlic powder, stirring to coat. Cook chicken 2–3 minutes. Add pasta, broth, and water to the pot. Close lid, lock pot, select “Manual” setting and 4 minutes time. Cook pasta until the time is up, then quick release and open Pot. Stir in cream cheese, pepper jack cheese, and cooked bacon until combined; let the pasta sit 5 minutes to thicken. Serve immediately. To reduce the heat from the jalapeños, remove seeds and membranes before chopping. Looks yum! i love jalapeno poppers!!! You can give it a try. I haven't made this in the crock pot, so I am not sure what adjustments need to be made.